As your SMB merchant business continues to grow, how do you gain a single view of unified data on your customers, sales and reports across channels? It involves removing redundant manual data entry and streamlining overall processes. For more and more companies, a cloud-based unified data solution is the way to make this happen. 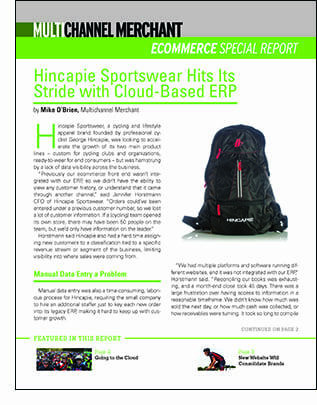 Custom cycling apparel maker Hincapie Sportswear has leveraged this capability to gain greater visibility into revenue streams, turning opportunities into sales more quickly while gaining overall operating efficiency.